From an earthly perspective, all was lost, all was over. Jesus’ life had come to an end. His body lay in the tomb, the stone covered the entrance and His followers were scattered. Where was our Blessed Mother through all of this? Though Scripture does not reveal her physical location, we can be certain that our Blessed Mother kept vigil from Good Friday until Easter Sunday. She kept vigil, first and foremost, in her heart. Throughout her life she continually pondered the mystery of her Son. She pondered His conception, His birth, the flight into Egypt, His childhood, and every moment of His public ministry. Over the past week she had pondered His suffering and His brutal death. But through all of this pondering, her Immaculate Heart was alive with confidence and perfect trust. Her mind perceived the wisdom of the Father’s plan and her heart gave it her full assent. She knew, without any shadow of a doubt, that the will of the Father was unfolding perfectly. As our Blessed Mother prayerfully pondered the life and death of her Son that Holy Saturday, her heart would have been filled with a peaceful excitement and joy. She may not have known exactly how His Resurrection would unfold, but she knew with conviction that He would soon return to her. She did not allow despair to enter her Immaculate Heart for even a moment. Instead, she kept a prayerful vigil for her Son and awaited the fulfillment of His promise that He would rise on the third day. She had heard Him say this and she knew it was true. Her only duty now was to wait in vigilant prayer and expectation. Hope is a supernatural gift from God. It’s not just wishful thinking or optimism. Hope is a gift by which God makes an interior promise to each one of us. The promises He makes are the perfect revelation of His divine will. As we hear Him speak His promises, we must respond with faith. Reflect, today, upon this most sacred scene of Holy Saturday. While many were filled with despair and confusion, our Blessed Mother continued her vigil of hope. She knew, without any doubt, that glorious things were still to come. She knew that her Son had completed His mission of salvation and was on the verge of restoring new life to all who would turn to Him in their need. Reflect upon your own hope in the promise of God in your life. Allow the example of our Blessed Mother to inspire you. Allow her prayers to transform you. Do not doubt for a moment that God has great things in mind for you. For those who believe, the Resurrection is always but a moment away. My dearest Mother, allow me to keep vigil with you as you waited in perfect hope for the Resurrection of your divine Son. Help me to understand the beauty of every virtue alive in your Immaculate Heart. Help me to understand that the suffering you endured brought forth the perfection of virtue in your life, especially the virtue of divine hope. My dear Mother, pray for me that I may be open to the promises of your Son in my life. Pray that I may hear Him speak to me and reveal His perfect plan. May I trust in that plan, even when all earthly hope seems lost. May I follow your own Immaculate example and trust in your dear Son always. 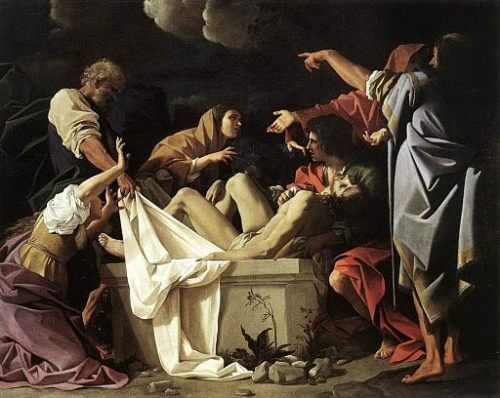 My resting Lord, as You lay in the tomb that Holy Saturday, You filled the heart of Your dear mother with an abundance of hope as she awaited the fulfillment of Your promise. You also promise me, and all who believe, that the sufferings of life are not the end. Your Resurrection is before me and You promise to transform my life and the lives of all who trust in You. Give me the grace I need to keep vigil with Your dear mother no matter what cross I face in life.